A leading light in sustainable construction, Skanska Construction UK Ltd has once again embraced the circular economy of materials. 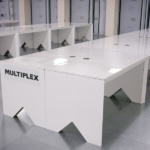 Following the successful installation of ECO360 desks at their New Papworth Hospital project, Skanska approached TCi to carry out another office furniture fit out on their central London project office at 51 Moorgate. With all furniture delivered, unloaded and assembled on site in a single day due to the rapid assembly of the ECO360 desks, the office was ready for occupation by the project team straight away. The furniture package was delivered and installed by TCi furniture WORKS, operating a tree-planting scheme to offset the carbon footprint generated during transit. Skanska’s central London project office is based at the heart of a number of high-profile developments in the City’s historic financial district. The contemporary street Moorgate takes its name from the postern which once stood on the Northern side of the London Wall, originally built by the Romans. Today, streets such as Bishopsgate, London Wall and Moorgate are synonymous with investment banking and feature some striking new developments amongst the traditional and historic architecture. The area has become more accessible with the recent Crossrail/Elizabeth line and presents some prime development opportunities. Skanska is one of the world’s leading construction and project development companies, focused on selected home markets in the Nordic region, Europe and USA. How much recycled cardboard is in my ECO360® sustainable cardboard desk?